Hitachi Seaside Park (国営ひたち海浜公園 Kokuei Hitachi Kaihinkouen) located in Hitachinaka, Ibaraki, Japan is a 190-hectare national park and is one of the best places to visit during the autumn season. The colorful cosmoses and blazing red kochia bushes or commonly known as burning bush, ragweed, summer cypress, or Mexican fireweed covering the Miharashi hill (みはらしの丘), located at the northwestern garden, allow the visitors to experience a unique fall colors. 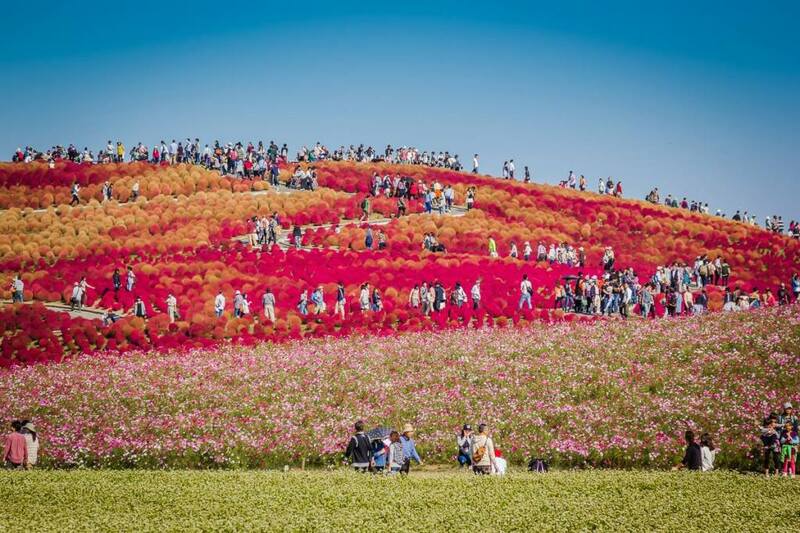 The Miharashi no Oka hill with the colorful kochia bushes.